Both the Rockefeller and The Empire State Building are well known and legendary buildings that are entrenched within the history of New York City. But lets admit it, as much as the Rockefeller is a great building, it’s the Empire State Building we come to see…but the question to ask is. Do you want to be on top of it or have the most amazing view of it? Now there is where this post comes in! This 102 storey skyscraper in Midtown is one of the most famous buildings in the world and a true icon of the city and the Empire state itself! Completed in 1931 it stood as the tallest building in the world for over 40 years until the completion of the original Twin Towers in Downtown Manhattan. After the attacks it once again became New York’s tallest building until the new One World Trade Centre was completed. The Empire State Building has even played host to a crazed King Kong swinging off it’s antenna! It has been in the backdrop of so many films, tv programmes and even computer games over the years, the art deco building is truly an American cultural icon. It even made the list of Seven wonders of the modern world! The 1,454 ft tall building offers sweeping panoramic views over the city and beyond, of the famous and beautiful Chrysler building, central park and of course the new World Trade Center all the way in Downtown, you can even make out the Statue of Liberty…but there is one icon missing from this view…the thing you are stood on! $32 (Adult), $29 (Senior), $26 (Child). There are also various VIP packages available if you feel plush! I will admit that before going to New York I was only vaguely familiar with the Rockefella as opposed to being borderline oppressed with seeing the Empire State building on my first visit! However as we visited as a student group I went along and discovered a viewing platform with arguably the greatest panorama in the world! Also an Art Deco icon of the city and designated National Historic Landmark it was completed only a few years after the Empire State Building in 1939. The history of the building is of course tied in with the Rockefella dynasty of America and was commission as one of the largest private constructions in modern times. As such there are over 19 buildings as part of the huge complex! The “Top of The Rock” not only offers much the same view of this amazing city as the empire state building but the true selling point here is exactly that…the unbeatable view of the Empire State Building itself in front of that stunning view! Plus, you can also see much more of the interior including some amazing Art Deco Art work, in winter there is also the famous Christmas tree and ice rink! $32 (Adult), $30 (Senior), $26 (Child). There are also tours of the building, a restaurant and a small mall. So, what would we choose? Well, I have to be straight with you here, we have done both and ultimately that might be the only way to satisfy your desire to fully experience New York. But…I have been up the Empire State Building once and to the Top of the Rock three times. So honestly if I had to say which one I enjoyed the most, the Rockefella takes it with that view! And to be lucky enough to see that three times, on my own, with my partner for life and then with my family right before getting married. That was unforgettable! But a good option if you have the time and money is one during the day and one at night! There is the new One World Trade centre of course which wasn’t open when we visited. We would love to venture up this new icon of the city but I am in no doubt the views from the Rockefella are better! Sometimes these buildings can just be too high! Then of course you could stay in a hotel with great views, but that might be quite expensive! Or you can cross over the Brooklyn or Manhattan bridge and get some stunning views of the city. The Staten Island ferry is also free and the view of Downtown is a must see! Just walking around the few blocks around the Empire State building, or down adjacent avenues gives you great views of it within the surrounds of the city! 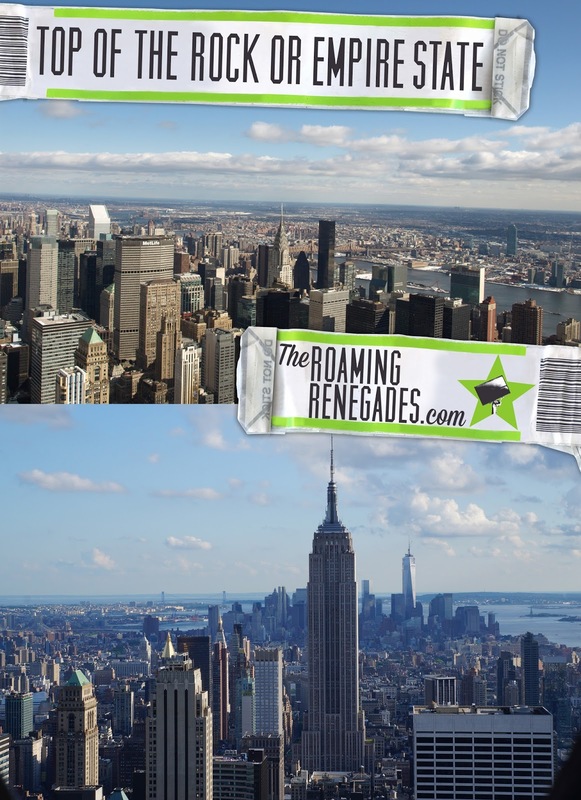 Bookmark this article The Top of The Rock vs The Empire State Building! Which to spend your money on! A quick guide to AMSTERDAM. An amazing weekend in Holland!